Did you know that there are modern dental technologies that have made root canals easier than ever? Here at Simply Teeth, our goal is to provide our patients with high quality service, which is why we use rotary endodontics during a root canal treatment. If possible, other minimally invasive treatments will be used before a root canal is suggested. But, there are circumstances where a root canal treatment is necessary to remove decay that has occurred within a tooth. When the infection is located on the interior of the tooth, the only way to treat the infection is by cleaning out the root of the tooth. 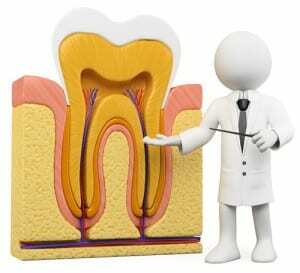 After the infection and decay have been removed, then the interior of the tooth is sealed to protect the quality and integrity of the tooth structure. This treatment will save your tooth, and modern technology has made it possible to complete this procedure quickly and easily. We understand that many patients are uncomfortable with the idea of having a root canal, so we use the rotary endodontics technology to make you as comfortable as possible during the treatment. This method uses an electric hand piece, which is a superior method over the traditional manual files that have been used in the past. By using this technology, we are able to reduce the drilling noises and complete root canals faster than ever. When you have a tooth that needs a root canal, it is best to take action as soon as possible to get rid of the infection. It might be tempting to delay the appointment if you don’t like going to the dentist, but it could result in a situation where you experience higher levels of pain and the infection could get worse. It is always best to have the root canal treatment as soon as possible, in order to protect your tooth and help you feel better. Rotary endodontics technology has made a root canal as easy as a standard dental filling, so there is nothing to be nervous about! For more information about the root canal treatments available here at Simply Teeth, we invite you to contact us right away. We will gladly schedule an appointment for you and answer any questions that you might have about the treatment options that are offered. Call us today!